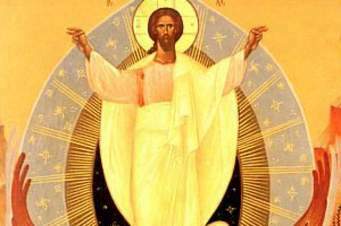 This joyful Eastertide, away with sin and sorrow! My love, the crucified, has sprung to life this morrow! Would Christ that once was slain, ne'er burst his three day prison, our hope had been in vain, but now has Christ arisen! Most people in the ancient Near East would have eaten sparingly and with little dietary variation. A great and lavish feast was an obvious symbol of God’s restoration of shalom on earth, a symbol that carries into the New Testament. This vision is also important because of its inclusion of “all nations.” Israel and its rival neighbors will live in peace. It is such a joyous and monumental vision, that even death is overcome. 25:6 On this mountain the Lord of hosts will make for all peoples a feast of rich food, a feast of well-aged wines, of rich food filled with marrow, of well-aged wines strained clear. 7 And he will destroy on this mountain the shroud that is cast over all peoples, the sheet that is spread over all nations; 8 he will swallow up death forever. Then the Lord God will wipe away the tears from all faces, and the disgrace of his people he will take away from all the earth, for the Lord has spoken. 9 It will be said on that day, Lo, this is our God; we have waited for him, so that he might save us. This is the Lord for whom we have waited; let us be glad and rejoice in his salvation. This short passage is part of a long story (Acts 10:1—11:18) about how the Gentiles came to be understood as having the same relationship with Jesus as his fellow Jews. The apostle Peter and the gentile Cornelius have both had visions causing them to seek each other out. When Peter meets Cornelius in the latter’s own house (a line observant Jews were not to cross), he experiences the Pentecostal Spirit at work among them just as he and his fellow disciples had experienced it. This leads to the following declaration. It is a testimony to the power of Jesus’ passion, death, and resurrection. Psalm 118 is a song of thanksgiving rooted in Israel’s worship of a faithful God. It has long been associated with Holy Week and Easter because the first part of the psalm acknowledges distress, and the second half pivots to gratitude for deliverance. The stone which the builder’s rejected has become the chief cornerstone is used by Matthew, Mark, and Luke (in Acts) to describe what God has done in Jesus Christ. In these verses, Paul rehearses the tradition of the resurrection that has been handed down to him. It includes, in verses 3b-5, the beginnings of a Christian creed. Paul also cites historical evidence of which he is aware: the appearance to Peter (Cephas), to the twelve, to a large number of believers (a story that has been lost), and then to Paul himself on the road to Damascus. He doesn’t know the tradition of women being the first witnesses or chooses to ignore it. 15:1 Now I would remind you, brothers and sisters, of the good news that I proclaimed to you, which you in turn received, in which also you stand, 2 through which also you are being saved, if you hold firmly to the message that I proclaimed to you—unless you have come to believe in vain. 3 For I handed on to you as of first importance what I in turn had received: that Christ died for our sins in accordance with the scriptures, 4 and that he was buried, and that he was raised on the third day in accordance with the scriptures, 5 and that he appeared to Cephas, then to the twelve. 6 Then he appeared to more than five hundred brothers and sisters at one time, most of whom are still alive, though some have died. 7 Then he appeared to James, then to all the apostles. 8 Last of all, as to one untimely born, he appeared also to me. 9 For I am the least of the apostles, unfit to be called an apostle, because I persecuted the church of God. 10 But by the grace of God I am what I am, and his grace toward me has not been in vain. On the contrary, I worked harder than any of them—though it was not I, but the grace of God that is with me. 11 Whether then it was I or they, so we proclaim and so you have come to believe. Mark’s account of the resurrection is, like his Gospel, short. It does, however, pack in many details. The women who come to the tomb are the same as those mentioned in the previous chapter as having witnessed Jesus’ death. The young man in the tomb neatly summarizes what the Gospel is as Mark understands it. Jesus is the forever crucified and risen One. The women are sent forth (as apostles?). They are ecstatic (a better translation than “amazement” and filled with “awe” (a reasonable alternative translation to “afraid.”). Most scholars believe Mark originally ended his Gospel here. 16:1 When the sabbath was over, Mary Magdalene, and Mary the mother of James, and Salome bought spices, so that they might go and anoint him. 2 And very early on the first day of the week, when the sun had risen, they went to the tomb. 3 They had been saying to one another, “Who will roll away the stone for us from the entrance to the tomb?” 4 When they looked up, they saw that the stone, which was very large, had already been rolled back. 5 As they entered the tomb, they saw a young man, dressed in a white robe, sitting on the right side; and they were alarmed. 6 But he said to them, “Do not be alarmed; you are looking for Jesus of Nazareth, who was crucified. He has been raised; he is not here. Look, there is the place they laid him. 7 But go, tell his disciples and Peter that he is going ahead of you to Galilee; there you will see him, just as he told you.” 8 So they went out and fled from the tomb, for terror and amazement had seized them; and they said nothing to anyone, for they were afraid. 20:1 Early on the first day of the week, while it was still dark, Mary Magdalene came to the tomb and saw that the stone had been removed from the tomb. 2 So she ran and went to Simon Peter and the other disciple, the one whom Jesus loved, and said to them, “They have taken the Lord out of the tomb, and we do not know where they have laid him.” 3 Then Peter and the other disciple set out and went toward the tomb. 4 The two were running together, but the other disciple outran Peter and reached the tomb first. 5 He bent down to look in and saw the linen wrappings lying there, but he did not go in. 6 Then Simon Peter came, following him, and went into the tomb. He saw the linen wrappings lying there, 7 and the cloth that had been on Jesus’ head, not lying with the linen wrappings but rolled up in a place by itself. 8 Then the other disciple, who reached the tomb first, also went in, and he saw and believed; 9 for as yet they did not understand the scripture, that he must rise from the dead. 10 Then the disciples returned to their homes. 11 But Mary stood weeping outside the tomb. As she wept, she bent over to look into the tomb; 12 and she saw two angels in white, sitting where the body of Jesus had been lying, one at the head and the other at the feet. 13 They said to her, “Woman, why are you weeping?” She said to them, “They have taken away my Lord, and I do not know where they have laid him.” 14 When she had said this, she turned around and saw Jesus standing there, but she did not know that it was Jesus. 15 Jesus said to her, “Woman, why are you weeping? Whom are you looking for?” Supposing him to be the gardener, she said to him, “Sir, if you have carried him away, tell me where you have laid him, and I will take him away.” 16 Jesus said to her, “Mary!” She turned and said to him in Hebrew, “Rabbouni!” (which means Teacher). 17 Jesus said to her, “Do not hold on to me, because I have not yet ascended to the Father. But go to my brothers and say to them, ‘I am ascending to my Father and your Father, to my God and your God.’” 18 Mary Magdalene went and announced to the disciples, “I have seen the Lord”; and she told them that he had said these things to her. The Scripture quotations (except for the psalm) are from the New Revised Standard Version Bible, copyright © 1989 by the Division of Christian Education of the National Council of Churches of Christ in the U.S.A., and are used by permission. All rights reserved. The Psalm translation is from The Book of Common Prayer. Commentaries are copyright © 2018, Epiphany ESources, 67 E. Main St., Hornell, NY 14843, www.epiphanyesources.com. All rights reserved. Permission is granted to copy for congregational use, including the copyright statement.